Cleaning: Over the course of several months, a grill can become quite dirty! It is a good idea to keep your grill grates, cook box, and drip pans clean of excess soot and grease, so that you experience fewer flare-ups and more accurate cooking temperatures! Clean your grill from the top – down. A plastic puddy knife works great for cleaning your cook box, Flavorizer bars, drip pans, etc. By scraping these surfaces clean from build-up you eliminate the chance for hot grease to puddle and cause flare ups. Large foods that may have fallen through the grill and lay in the drip pan can catch fire, so it is best to remove these foods once the grill has had a chance to cool down. Cleaning your burner tubes. If you have noticed uneven cooking temperatures, it is possible that your burner tubes are clogged or corroded. It is important when you are inspecting your grill to rub a grill brush along the burner tubes to open up any of these clogged openings. This will ensure a more even distribution of heat in your grill. Clean grates before each use. You will want to preheat your grill to about 450-500 degrees to loosen up the food scraps that were left on the grill from the prior use. With a brass or stainless steel brush, wipe the grill grates clean. It is best to follow this up with a wet paper towel to pick up any fine soot or even bristles that may have been left behind from an old brush. If you prefer, you can perform these steps at the end of each cooking instead. Thorough cleaning of grates or Flavorizer bars. Remove dirty grates and bars from your grill and place inside a heavy duty trash bag. put several ammonia-saturated cloths in the bag along with the grill parts. The fumes from the ammonia will soften and break-down the burnt-on residue. Be sure to leave out in the warm sun for about 24 hours. Wipe the grates clean and rinse with water the next day! Click here for instructions on eHow. We recommend replacing Weber’s Flavorizer bars about every 3-4 years. If your grill has lava rock or briquettes, we recommend that you replace these components every other year. Grill brushes should be replaced each year. Old grill brushes that begin to wear can leave bristles on the cooking surface, which can get into your food and end up being ingested. Stainless steel bristles that are found on most grill brushes now a days hold up better than brass and will not weaken as quick. You may want to consider a grill brush, like the Grill Daddy Brush, which steam cleans your grill grates with water while you brush them clean. The brush heads on these can be replaced each year to keep them fresh, which is a nice feature! Why is my grill temperature not getting above 200 degrees F? This is one of the most common questions we get from customers each year regarding their grills. With propane grills, we have been trained to close the valve on our propane tanks after each use. Even though this is not necessary, it is typical for companies to recommend this procedure. 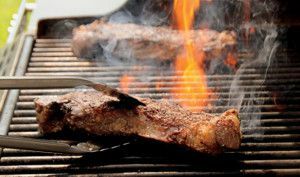 If this is not done correctly, or done too quickly, the “excess gas flow control” will be activated and your barbecue will not be getting the gas flow it needs to reach peak temperatures. This can happen for several reasons: 1) a burner value is left open when you are opening or closing the valve on the propane tank. 2) one attempts to light the grill too soon after opening the valve on the propane tank and not giving time for the hose and regulator to pressurize. It is important that each time you open the valve on your grill that you give it about one minute for the regulator to build up pressure. If you suspect your hose and regulator may need to be reset, you will want to turn the grill entirely off, close the valve on the tank, and disconnect the hose from the propane tank. Wait about 5 minutes – this will give the hose and regulator a chance to reset. Making sure that your burners are in the off position, reconnect your propane tank and open the valve on the propane tank to allow the grill to pressurize. Wait another minute or so, then try to ignite the grill and see how far your temperature reaches. If temperatures do not improve, then your hose and regulator are bad and need to be replaced. Why is “paint” peeling off from inside my grill? What looks like paint, is actually grease, steam, and soot that have clung to the insides of your lid or cookbox and, through heating and cooling, have begun to peel back from those surfaces. It is almost always black and flakes just as if it were paint. Do not be alarmed; it is simply remnants of the cooking process and should just be scraped clean from the grill as needed (about once a year works pretty well)!